A toaster oven is more diverse than most people think, it can do more than just make toast. Some people even use it to replace their standard oven. There’s a lot of different brands that sell toaster ovens, and it can be overwhelming to pick one. This article will look into Cuisinart toaster ovens, along with their pros and cons. As mentioned before, toaster ovens are very diverse. If you are thinking you don’t need a toaster, then you are sadly mistaken. When you have a smaller cooking space, a toaster oven is a great alternative to a standard oven – if you make sure the model you buy has all the features you need. Some toaster ovens are able to cook a wide range of food. If you make a lot of cookies, a toaster oven is a great way to get extra cooking space. For example, if your regular oven is full and you have a little leftover, you can put them in the toaster oven. It can take a while for a regular oven to preheat because of how large they are. This can be an annoyance when all you want to do is heat up leftovers. Toasters are perfect for this type of situation. Because it’s smaller, it needs less energy to run. It makes them the eco-friendlier choice compared to standard ovens. If you already live in a warm climate, the last thing you want is something that makes you hotter. The standard oven is large and generates more heat. A small toaster oven, on the other hand, doesn’t generate as much heat. Some people can find it uncomfortable to bend over to get things from the standard oven. It can also increase the chance of getting burned in the process. There is no bending needed with a countertop oven. It’s not a big deal, but nobody like to clean out their oven. There are some hazards associated with the self-cleaning feature in many large ovens that can give you pause. Because they are smaller and easier to access, toaster ovens are easier to clean. To be fair, we should share a few reasons why a toaster may not be the best choice for you. There are more benefits than takeaways though. The most obvious drawback is that it’s small, there’s a lot less space compared to a standard oven. They can only cook small pizzas or bake half a batch of cookies. This means that it can take longer to cook for more than 1 person. Countertop ovens can handle cooking microwave meals, but you need to take additional steps. For example, they have to be moved out of their plastic containers into an oven safe dish. Microwave meal manufacturers generally don’t include toaster oven instructions on the box. This is because they don’t want to be liable if someone melts the included plastic containers in an oven. So trial and error will be needed and it does take longer to heat food up. Some people with smaller kitchens use their microwave as a faux kettle. They do this by putting mugs full of water in order to make tea. You can’t do this in a toaster oven. You will need another appliance for tea. Cuisinart is a company that manufactures kitchen appliances. It was founded by Carol Sontheimer. Famous chefs like Julia Child and James Beard were the first to endorse the company, this happened when Sontheimer introduced the food processor to the world. Even now, many celebrity chefs endorse this brand. The company’s goal is to help chefs of all levels be able to cook like a professional. Their designs have won a lot of awards including the Gold LACP Spotlight Award, Gold Hermes Award, Chicago Athenaeum Award, MarCom Gold Award, Platinum MarCom Award, Silver LACP Spotlight Award, Award in Countertop Food Prep Appliances, Platinum MarCom Award, Silver LACP Spotlight Award, and Gold Hermes Award. Many toaster ovens made by Cuisinart have a special feature called “even shade control”. This monitors the temperature and adjusts the time to consistently toast to the shade selected every time. For the bagel setting, the top elements throw off more heat, so that the top of the bagel comes out crisp and browned while the bottom comes out less crispy. It also has an easy to access crumb tray and it covers the entire bottom of the oven. This means nothing will get underneath it. If anything gets stuck on the sides of the interior, it will be easy to wipe away thanks to its nonstick design. Finally, the cooking rack pops out when you open the oven door. This makes placing and taking food out a lot easier and safer. Cuisinart is a great brand because they make a variety of toasters at a wide range of prices. A Cuisinart toaster oven can cost anywhere between $20 all way up to $200. So there is a Cuisinart toaster oven for every budget. 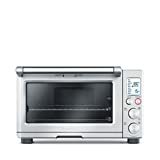 You can purchase a Cuisinart toaster oven from a variety of places like Amazon and Best Buy. Since there are many different kind of toasters made by Cuisinart, we will focus on Cuisinart TOB-40N Custom Classic Toaster Oven Broiler. We will break down what customers of each purchasing site thought of this toaster. This will give you an idea of what is good and bad about it. On Amazon, it has a 3.6 star rating. People like this Cuisinart toaster oven because it’s easy to clean out. The crumb tray or drawer slides out easily. The design is good too. It’s long from front to back instead of side to side. This is so that people with limited space will be able to use it and cook large meals within it. If it was wider than it was longer, then people may not be able to use it. People felt that it heated food evenly and cooked a variety of different food well. People did complain that it seems to run hotter than other toasters. This resulted in a lot of burnt food and frustration. People also felt that it was hard to read the dials, that the letters were too small. People mentioned that this toaster only lasted around 5 years. For some people felt this was too short, while others were fine with it. On Best Buy’s website, this Cuisinart toaster oven has a 4.5 star rating. Perks of this toaster. according to reviews, are that it’s feels like it was made to be durable. It also heats up quickly and is able to retain heat very well. The easy to access crumb tray was mentioned once again. Many people were able to cook a variety of food in this toaster successfully. Takeaways are that there isn’t an internal light. People also feel like it’s hard to use. That it’s not intuitive to people who are new to the brand. They find all the dials to be confusing. People also felt that it burned toast too easily. Now that you’ve heard what customers think of a Cuisinart toaster oven, it’s time to see how the brand competes with other kitchen appliances. Cuisinart tends to toast faster than a Breville toaster. These 2 brands are tied when it comes to how evenly they toast. They both tend to overcook their toast with some areas looking almost burnt. Cuisinart gets ahead in the pizza round because it includes a pizza stone. Breville does not. Though Breville tends to cook more evenly than Cuisinart, which can have some burnt edges. Though to be fair, pizza settings on any toaster tends to be customizable. A lot of people use toaster ovens to bake cookies, so how do the brands hold up? Breville just barely slides ahead in this round. They are slightly more even than Cuisinart. Cuisinart beat Breville when it comes to roasting a chicken. It’s faster and more even. Cuisinart is way faster than Hamilton Beach when it comes to time it takes to toast. When it comes to evenness of the toasting Cuisinart is the winner again. Though Cuisinart tends to overcook its toast. There’s nothing that looks close to burning with Breville toaster. Hamilton Beach doesn’t include a pizza stone in many of their models while Cuisinart does. Hamilton Beach cooks more evenly than Cuisinart. Though it takes longer to do so. Again, pizza settings on any toaster tends to be customizable. When it comes to baking cookies, Cuisinart and Hamilton Beach are tied when it comes to the evenness of the baking. Though points are taken from Hamilton Beach because sometimes their trays can cause a dropping affect because of their raised center. Cuisinart beat Hamilton Beach when it comes to roasting a chicken. It’s faster and more even. Overall, it seems that Kenmore toasts faster than Cuisinart, though it’s not as even as a Cuisinart toaster oven. Kenmore’s toasting is spotty at best. Parts of bread will not even be toasted while others look like they are about to burn. Cuisinart toast in general looks like’s overcooked, but at least it’s evenly overcooked. When it comes to pizza, both brands tend to include a pizza stone in their higher end models. 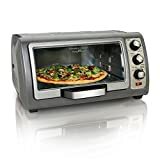 This will make toasting the pizza easier and make it more like what you would get from a restaurant. Cuisinart falls behind Kenmore when it comes to evenly cooking frozen pizza. Cuisinart is faster, but because of that, there are some spots that are burnt while others are barely cooked. Kenmore tends to bake cookies more evenly than Cuisinart. Cuisinart beat Kenmore when it comes to roasting a chicken. It’s faster and more even. We think that Cuisinart is a great brand. They really love the art of cooking and want to help people create good meals. But more than that, they make dependable kitchen appliances. Overall, people who bought their toasters and insiders both respect Cuisinart as a brand. While there can be some flaws with Cuisinart, that can be true of any brand. What’s especially great is that they have appliances of all prices. Any budget can find what they are looking for. This makes them accessible to everyone, which is wonderful. This is a brand that is worth looking into as you do your searching for the right toaster for you. Also, just because we focused on one specific model and maybe you didn’t fall in love with that one doesn’t mean that Cuisinart is not for you. They have many different models of toaster ovens, so we recommend that you still look into them, even if you didn’t like the model we used as an example. You never know what you’ll find.